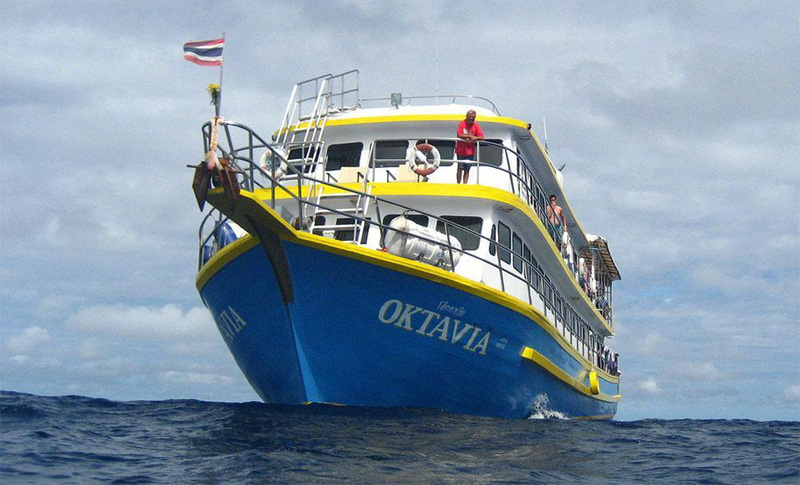 MV Oktavia is a very special boat which offers 2, 3, 4* & 5 night liveaboard cruises to the best diving sites of Thailand. At a length of nearly 30m, just twenty guests have more room to move around, relax, sleep and socialize. 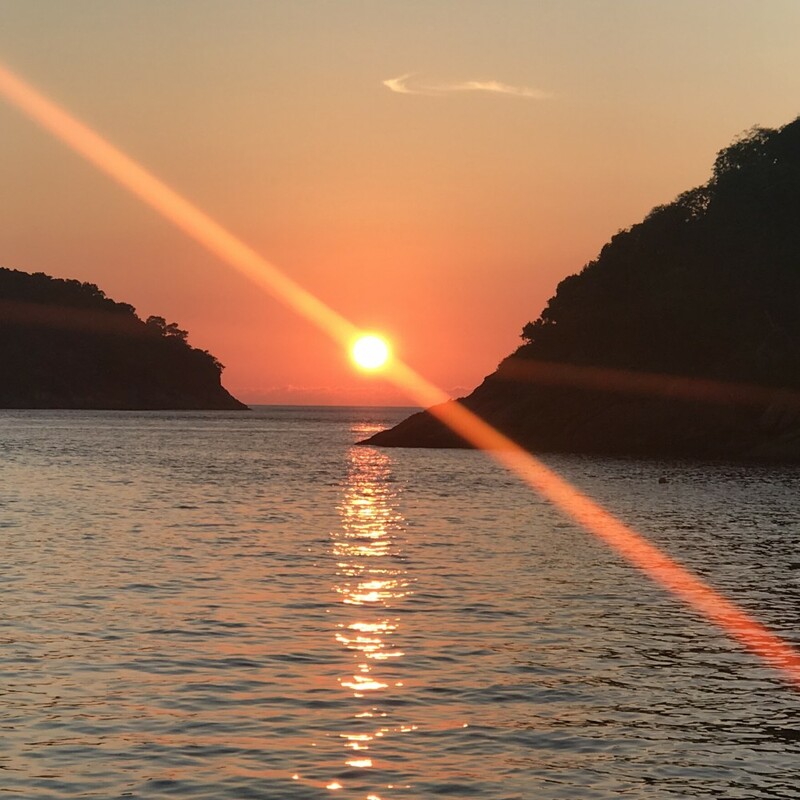 The boat’s cruises visit all of the best dive sites in Thailand’s Andaman Sea, including Richelieu Rock, and does so while offering a unique choice of trip length. Sitting between budget and mid-range price levels, liveaboard trips on MV Oktavia are excellent value for money, especially considering the service and organization. Oktavia guests are treated better than possibly all others who decide to go on a Similan diving safari. The whole process, starting when you book and finishing when you're dropped off at your hotel at the end of the trip, is a wonderful experience. Unlike most other Similan liveaboard boats, Oktavia’s dive centre run just this boat, so they are able to focus properly on just a few guests. 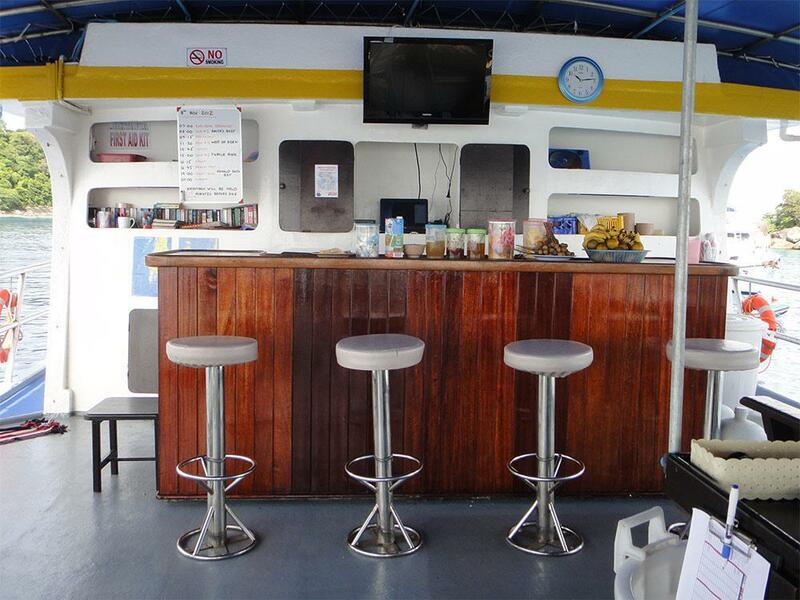 Many other dive centres run two or more boats, which results in a less-personal service and is more prone to errors. 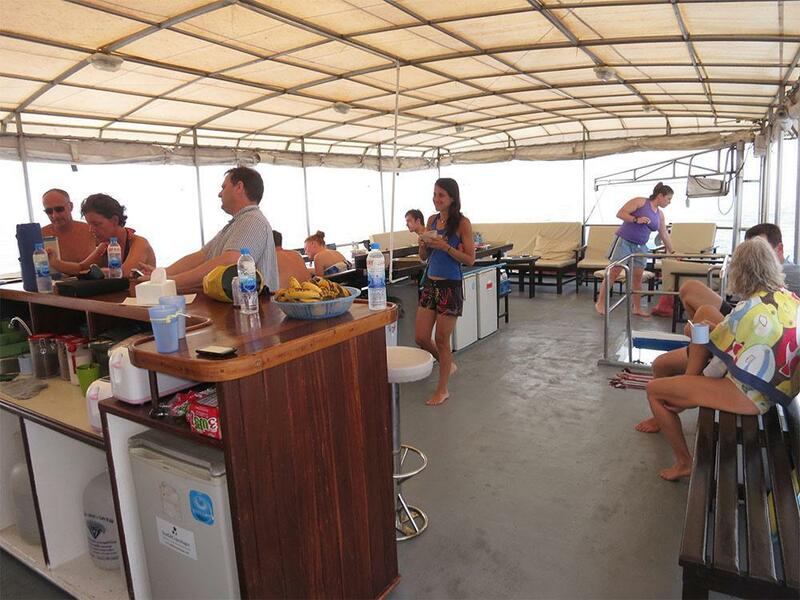 The boat has twin and double-bed standard cabins on the main deck, with hot-water shared bathrooms. 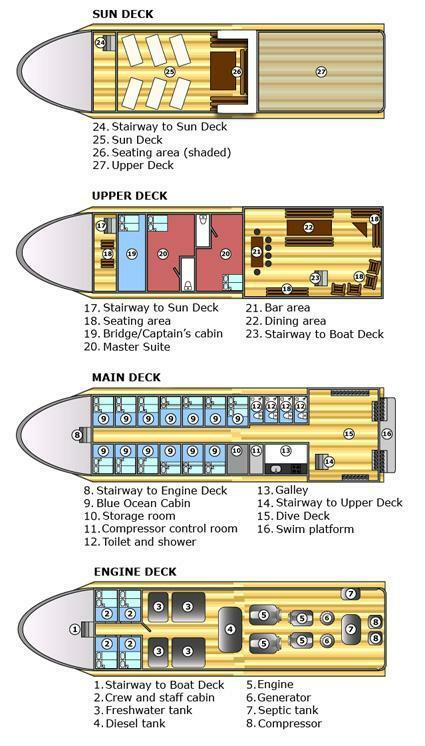 There are also two large master cabins on the upper deck, which have private bathrooms, armchairs and televisions. Although there are enough beds on Oktavia to accommodate thirty guests, each trip is limited to no more than twenty. And those who stay in standard cabins can choose between double and twin beds because there’s nearly always spare. 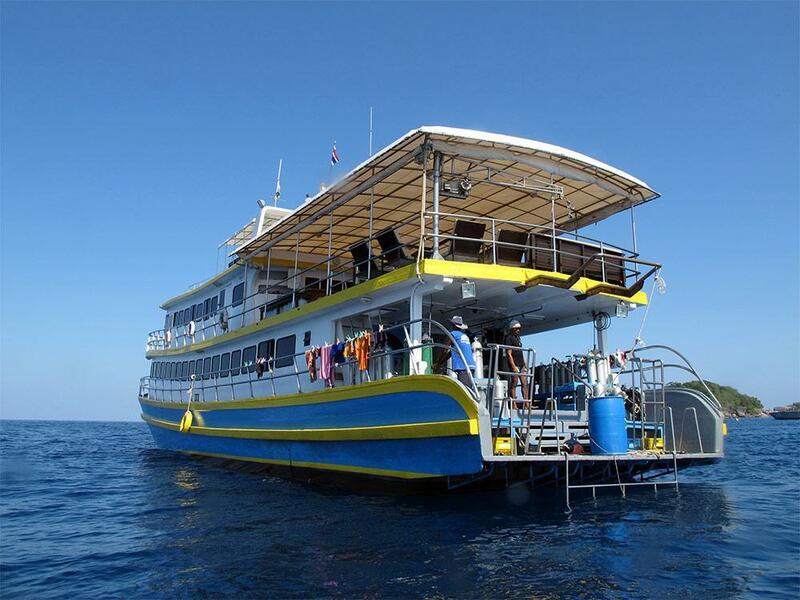 On top of this, Oktavia offers something else that other Similan liveaboard boats do not. Regardless of how many guests book on trips during the high season, the boat is guaranteed to set sail. Sometimes guests book to join a liveaboard safari only to find that not enough others have done so, and the trip is cancelled. Not only is this unfair, it can ruin plans for a diving holiday in Thailand. Unless specified, your Oktavia trip is confirmed to sail, even if you're the only guest! This is very useful and important for divers who plan flights and hotels months in advance. In addition to great management and guaranteed trips at low prices, Oktavia still has a couple more aces up its sleeve. 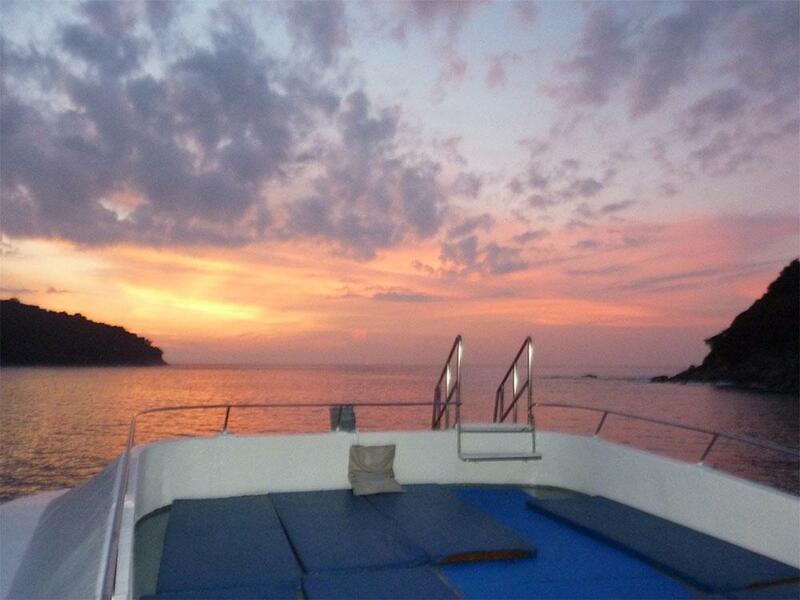 The first is that each cruise sets sail earlier in the day than most other Similan liveaboards. 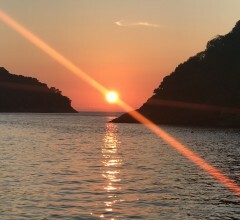 This has several advantages which include less hanging around, less activity at the pier by other dive teams, and reaching the dive sites before bedtime, which allows a better night’s sleep. The second 'ace' is that Oktavia’s rental diving equipment is stored on the boat and not back at the dive centre. Therefore, spares and alternative sizes are always available, even when out at sea. At the beginning and end of each diving season Oktavia’s trips are 4D/4N with 15 dives. However, for the most of the time diving on Oktavia is done over 2D/2N (7 dives), 3D/2N (10 dives) or 5D/5N (19 dives). This is achieved by the main boat sailing out for 5 days & nights but guests who join shorter trips are brought out (or back) by speedboat. Guests wanting a 2D/2N trip return on a speedboat at the end of the second day’s third dive. The same speedboat brings guests out to join Oktavia for the second part of the five day cruise, for 3D/2N at the more challenging but more rewarding northern dive sites. The luckiest guests stay aboard Oktavia for the full cruise. Nitrox fills and a selection of courses are available on Oktavia. Divers who aren’t certified to 30 metres (99ft.) 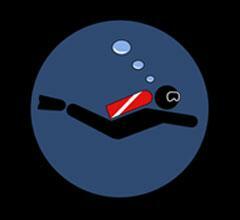 can take a quick ‘deep dive certification’ or do the Advanced course on board. For those who have families or don’t dive, there’s plenty to do during a trip, including snorkelling or visiting beaches. Unlike most other Similan diving liveaboards, if there are snorkellers on Oktavia, there will be an official snorkel guide and snorkelling itinerary. Other boats usually leave non-divers to do their own thing. Delicious food is served buffet style throughout the cruise. This is a wonderful blend of western and Asian cuisine, but not spicy. Vegetarians are always taken good care of, and those who have special dietary needs can eat well, too. Just let us know in advance. There are several itineraries on MV Oktavia, so please check carefully for your preffered trip. In summary, most trips depart in the early evening for 5 days & nights, returning mid-late afternoon on the final day. Most divers stay on board for the full 5 days & nights. 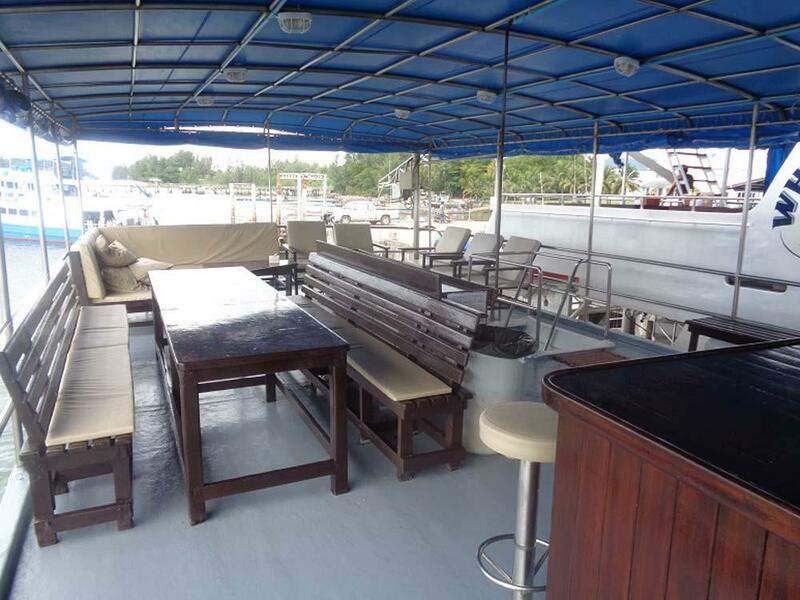 However, guests who choose 2D/2N trips, will depart at the start like everyone else, but then be brought back to Khao Lak by speedboat at the end of the second day. Guests who choose 3D/2N trips are transferred in the morning to join Oktavia. These guests need to stay in Khao Lak (not Phuket) the night before their trip. 4D/4N trips are just for the beginning and end of the diving season. For these trips there are no speedboat transfers, and everyone stays on board for the whole cruise. Built Year: 2003, Modified And Refurbished In 2018. Engines: 2 X Nissan Diesel 420 Hp, 10 Cylinders. Generators: 2 X 50 Kva. Electricity: 220 Volts, 24 Hours. Compressors: 2 X Bauer Mariner 250 - Electric With Air Cooling System And Air Filters. Coltri-Sub Continuous Flow Enriched Air (nitrox) System. Dinghy: 4.7m With Yamaha 40hp And Foldable Ladder. Safety: Life Rafts (40 Pax), Dinghy, Emergency Oxygen, First-aid Kit, Life Rings, Fire Extinguishers, High Water Alarm, CCTV-monitored Dive Deck, Crew Equipped With Radio, First-aid Trained Staff, Partner Of SSS Recompression Chamber Network. All Cabins Have Sliding Doors For Easy Evacuation. Life Vests (sizes XXXS - XXXL) Are Handed Out At Cruise Beginning To Ensure Guests Have The Correct Size And Are Aware Of Its Location In The Cabin. Communication: Satellite Telephone, Mobile Phones And Radio. Navigation: GPS, Compass & Depth Sounder. Guests: Max 22 (on Full Charters Max. 24). Cabins: 12 Blue Ocean Cabins: 6 Double Bed Cabins, 4 Cabins With 2 Bunk Beds, 2 Family Cabins With Double Bed Plus Bunk Bed. 2 Master Suites ( 25 M2 With One Double Bed And Option For 2 Spare Beds ). Facilities: 4 Shared Bathrooms With Hot Water Showers. 3 Showers On The Dive Platform. 2 Bathrooms En-suite / Master Cabins. Cabincomfort: All Blue Ocean Cabins Have Central Air-conditioning And Are Equipped With Fan, Reading Lights, Shelf Unit, Two Large Panorama Windows, Electrical Outlets, Sheets & Towels. On Fully-booked Cruises, Single Travelers May Have To Share A 2-bed Cabin With A Guest Of The Same Gender. The Master Cabins Have Individual Air-conditioning, Fan, Double Bed, Desk / Dressing Table, Two Arm Chairs, Private Bathroom, Flat-screen TV DVD & Mini-fridge. They Span Over The Width Of The Boat And Have Panorama Windows Both Port And Starboard. The Suites Are Ideal For Families. Crew: Captain, Engineer, Three Deckhands, Cook & Assistant Cook. Diving And Snorkeling: Max 6 Instructors / Guides (max 4 Divers Per Guide Or Instructor). 12-litre Aluminum Tanks, 2 Lbs Weights, Weight Belts. 15-litre Tanks And Nitrox 32% Fills Available. 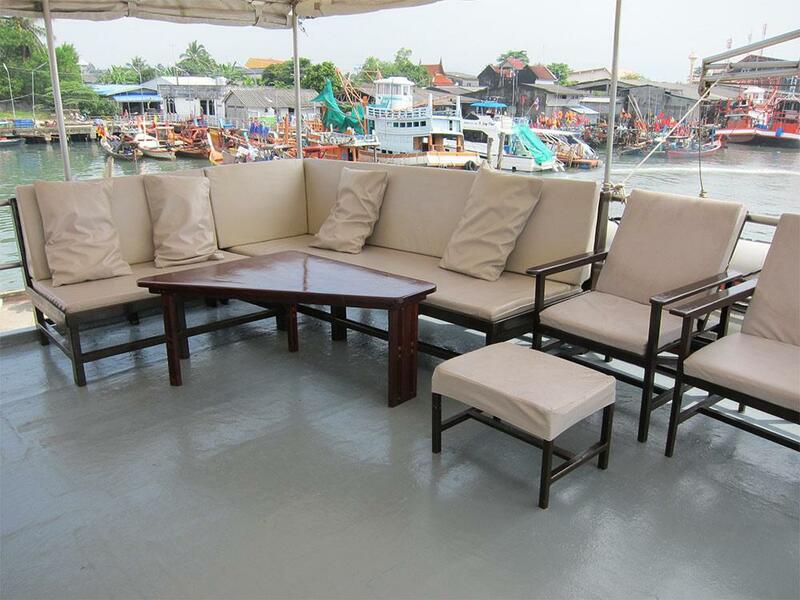 Miscellaneous: Lots Of Comfortable Seating, Large Sun Deck, Media-PC And LCD-TV, DVD/CD-player, Bar. Three Main Meals & Snacks Are Served As Buffets And Always Include A Vegetarian Dish. PADI & SSI dive courses are easily taught on Oktavia liveaboard trips. In fact, it's the ideal place to take part in one. There are plenty of options available, from a one or two dive mini-course, such as Deep Adventure Dive, to an Open Water Diver course for those who have never dived before. Prices start at just 1,500THB. The most popular diving course on an Oktavia liveaboard trip is the Advanced course. Please note, that the dives of a course do not add to the total number of dives on the cruise. Oktavia guests who are staying in Khao Lak get free transfers on departure day for all trips. Also, at the end of trip, there are free transfers back to Khao Lak hotels. Guests who are staying in Phuket or landing at Phuket Airport on departure day can get Oktavia transfers for a reasonable fee. This is only possible for 2D/2N, 4D/4N and 5D/5N departures. For 3D/2N trips, guests have to be in Khao Lak for the early-morning pick up. Overall a great liveaboard. Well organized, both before, during and after the boat trip. Locations have great diversity, from Macro to Whale Sharks and Mantas. Accommodation is basic - but good enough for 4-5days. Food is plentiful - with choices, but got a little monotonous. Loved the whole trip! Excellent instructor and the team on the boat. Well organized trip with professional diveguiding, good Thai food and servicemindes deckstaff. Steady Big bokat with good space Accomodation ok but could be excellent if carpet on cabins were removed and instead som Wood flooring Food great divemasters excellent and the boat is good!! We have spent a diving/snorkeling trip beggining of february 2018 for 5 nights and we ve had a great time! Amazing diving spots, amazing crew/team and dive guides, great food....Would sure come back if we have the opportunity!! Great time!! Very nice & competent staff! Would have liked whole grain bread instead of white bread. This is a serious dive boat but they were very nice to us snorkelers. Our guide Fernando was excellent! The food & accommodations were a little rugged but they the service & staff were excellent, and that’s the main point. 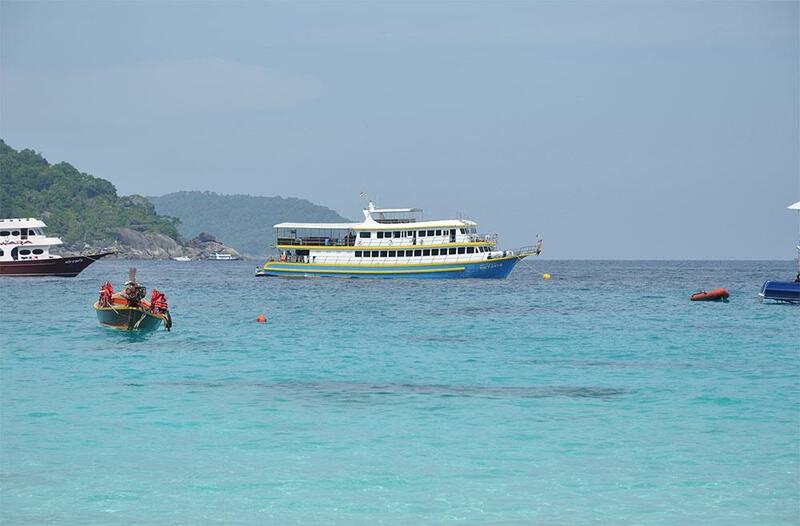 Plenty of opportunity to dive or snorkel to your heart’s content, & the Similans are beautiful! Prices include full-board accommodation throughout the cruise, including all meals and snacks and most non-alcoholic drinks. Divemaster guide services, weighbelts & weights, and 12-llitre tanks are also included in the rates. Not included are National Park Entry and diving fees, diving equipment rental (if required : 600 THB / day). Oktavia's rates for non-divers, children, and solo adults who want to ensure they have a cabin to themselves are the lowest of all our Similan Islands liveaboard trips. Non-diving guests receive 25% discount on cruise prices. Children of most ages are welcome. Please contact us for rates. All extra payments (such as park fees, equipment hire and alcohol) are paid in cash on board. Divers who are paying the balance of their trip need to..